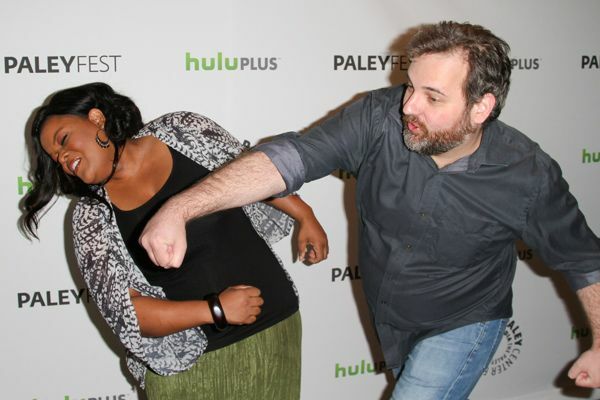 » Dan Harmon Might Have a New Job! A Multi-Camera New Job! Dan Harmon Might Have a New Job! A Multi-Camera New Job! On Tuesday, NBC’s Bob Greenblatt took the podium at the Television Critics Association Press Tour to quietly announce a change of direction. As Andy Greenwald explains, “Greenblatt ‘heaped praise’ on his ratings-challenged, critically beloved Thursday-night comedies, but then quickly qualified his enthusiasm: Returning shows like Community and Parks and Recreation, he said, ‘Tend to be a bit more narrow than we’d ultimately like going forward.’ In their place, Greenblatt is banking on broad, from the monkey high jinks of Animal Practice to the shrieking emotional babies (and the cute newborns they’ve fathered) of Guys With Kids.” Consider the timing, then, for this announcement: TV Guide is reporting that ex-Community showrunner Dan Harmon, the goddamn king of narrow, is in talks to create a new comedy for Fox. A multi-camera new comedy. Well then! Firstly, let’s congratulate Dan Harmon on not falling down a well of self-pity and Ben & Jerry’s, and also for not falling down any kind of literal wells either. You got up, you brushed yourself off, and you got a new job. God bless America, etc. Now, let’s unpack this a bit. There’s no word on the content of Harmon’s new comedy, but the fact that it’s multi-cam, and not single-cam like Community and the rest of the NBC elites, suggests a move toward the mainstream — the very same move to mainstream that Greenblatt, the guy who fired Harmon, was just crowing about. I’m betting on no. 2. Let’s consider this bit from the TV Guide story as proof: “At Fox, Harmon previously co-wrote the cult fave pilot Heat Vision and Jack in 1999. That quirky show, which starred Jack Black and Owen Wilson as the voice of a talking motorcycle (and was directed by Ben Stiller), is now considered to have been ahead of its time.” (Definitely ahead of its time. Nowadays the concept of Owen Wilson as the voice of a talking motorcycle is just, like, everywhere). Ask yourself: Can the talking-motorcycle guy really pull out “normal”? As he explained to Marc Maron earlier this month, Community honestly was the product of him trying to make a show lots and lots of people like. But, OK, either way — good luck, Harmon.